The rise of Manchester as a confident, contemporary metropolis steps up with the transformation of one of its cultural jewels, the Whitworth Gallery. 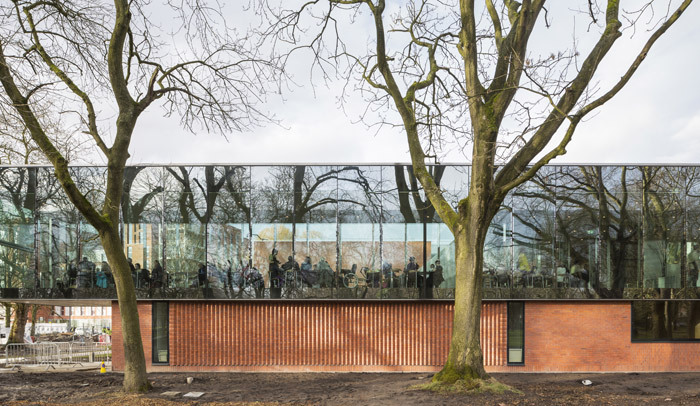 MUMA’s bold yet sensitive extension of the internationally significant institution is not just a major upgrade, but draws it right into its surrounding parkland. What more tranquil setting to contemplate art than surrounded by trees and parkland? 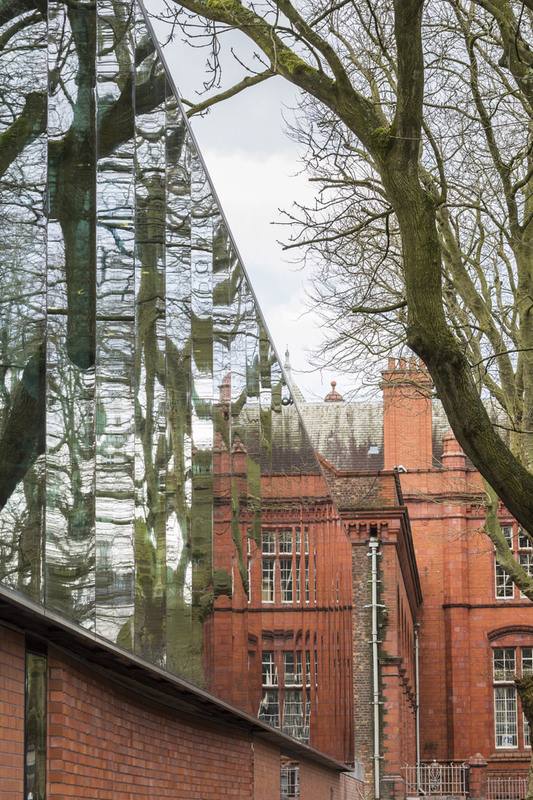 The Whitworth Art Gallery mature ash and London plane trees on two sides in one of Manchester's most beautiful green spaces, yet most of its galleries have been blind to it since it opened in 1908. 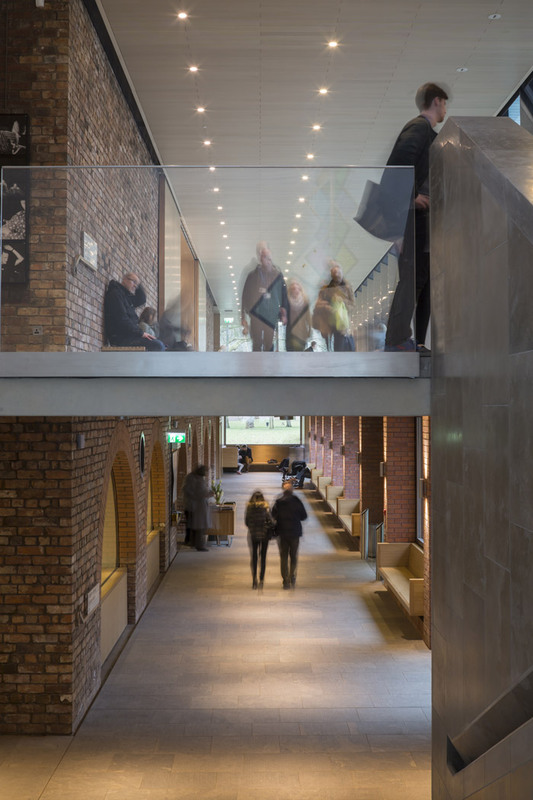 That all changed in February with a new extension, the highlight of the Whitworth's wider £15m-transformation by London-based McInnes Usher McKnight Architects (MUMA). 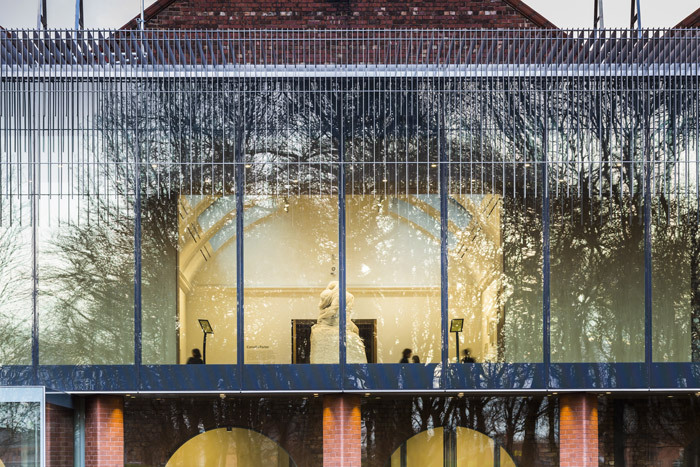 The extension delivers not just the revelation of outside, but a two-way transparency - founding partner Stuart McKnight says it was 'absolutely vital to look into the galleries from the park'. Furthermore, it gives the Whitworth 30 per cent more space - crucial not only for the art, but also to handle escalating visitor numbers. Maria Balshaw, the Whitworth's energetic director, is clearly pleased as she adds: 'We were bursting at the seams'. 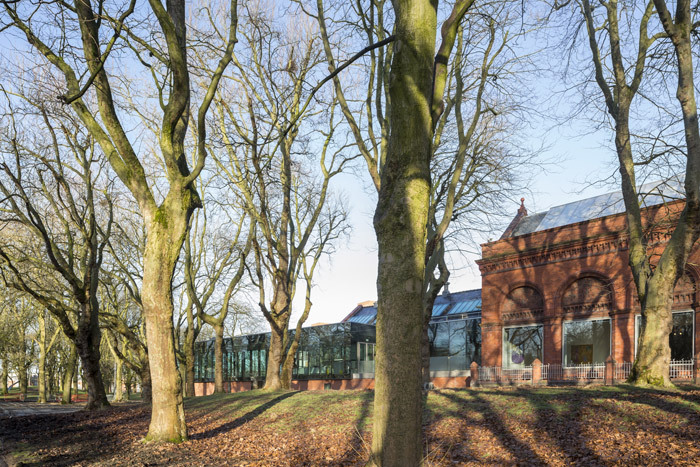 While the Whitworth has seen the number of visitors more than double since 2005, Whitworth Park conversely remains an oasis of tranquility sandwiched by the Manchester's University quarter and the stressed Moss Side neighbourhood. It was as if they were two different worlds. 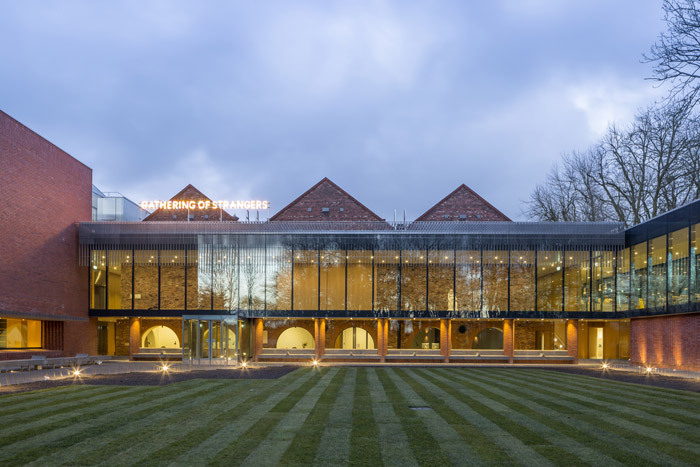 The Whitworth's eclectic collection ranges from work by Turner through Bacon, Freud, Peter Blake and Bridget Riley to the contemporary, and it has one of the world's great textile collections, its oldest examples dating back to the third century. It's all housed in a grand building designed by Manchester's own JW Beaumont. 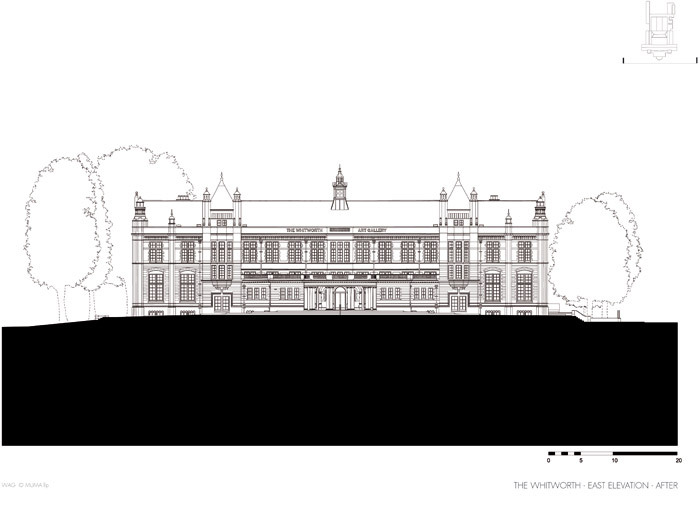 To the north-south Oxford Road, the Whitworth presents his original red terracotta and brick neo-Jacobean facade and columned semi-circular raised entrance. Here we first see MUMA's intervention. Gone are the old metal access ramp and Tarmac drive-in, replaced by a sculpture terrace and big steps that curve to splay out symmetrically before the building. They invite not just visitors to enter but anyone to stop and sit, maybe munch lunch (the hospital opposite brings a million people every yeart to this patch). McKnight recalls that in the entrance lobby, 'you couldn't move', but the space has been cleared, not least of the cafe, now spectacularly rehoused, as we shall see. 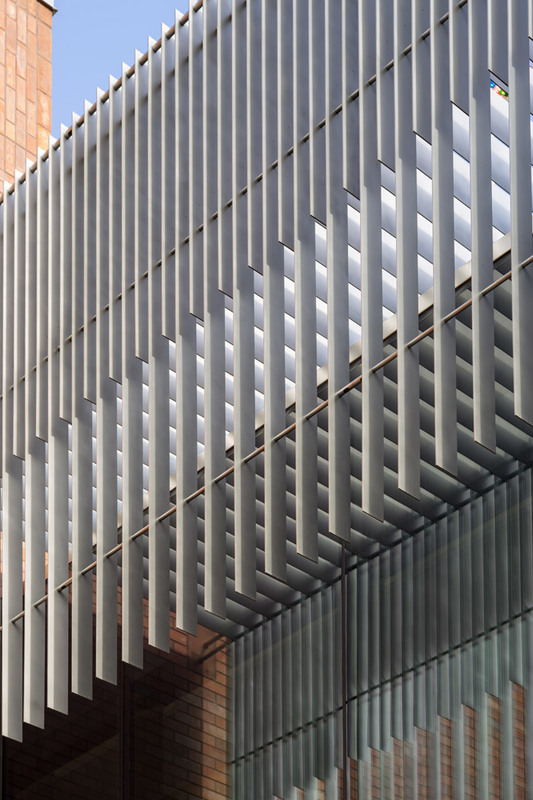 MUMA won the redevelopment competition in late 2009, just days before its RIBA Award-winning Medieval and Renaissance Galleries opened at the Victoria and Albert Museum. 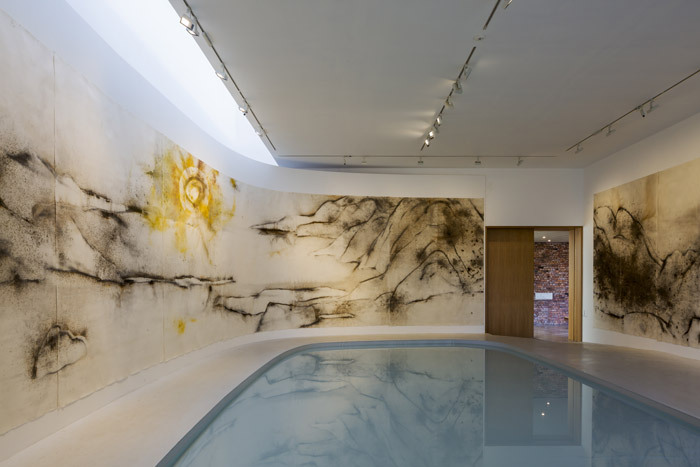 That building, just a year younger than the Whitworth, gave the practice the wide Brompton Road end to open 10 new galleries, nine within the existing footprint. In Manchester, the plan starts in existing space but pushes beyond it, and launches two volumes asymmetrically towards the parkland. And all without the loss of a single mature tree - just one bush went. First, suspended ceilings in those blind-ended, rear western spaces were removed, and barrel-vaulted ceilings - each with two rows of skylights - now look down from under the long pitched roofs. 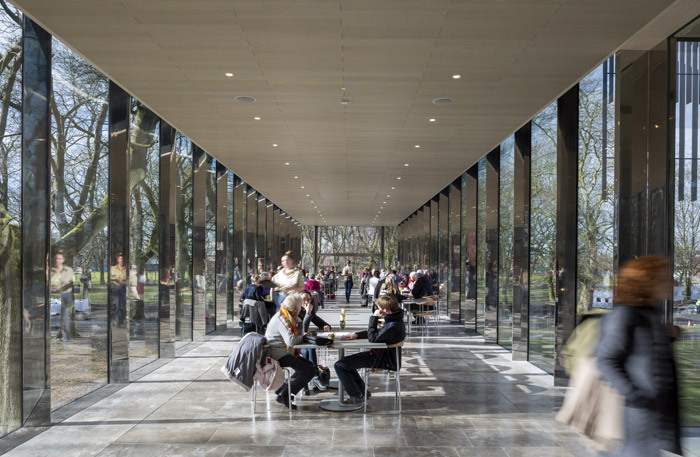 The northern space becomes the third of three parallel galleries, and in the central one full-height oak doors slide open to frame a view into the park - a work of art in itself, like a recent massive Hockney tree painting, but in light filtered by the trees themselves. 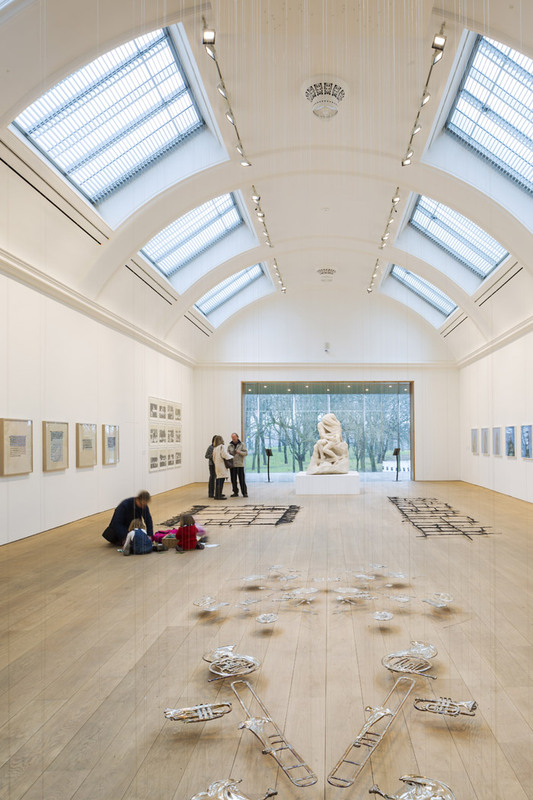 From the park, until the end May, people will glimpse a work based on Rodin's Kiss, by Cornelia Parker, who has the headline opening show in these galleries. Step through the opening and we are in the new-build. What had been empty space beyond the unlamented western brick wall is now a promenade around its three sides, paved with Dorset's Purbeck stone. The bricks are now inside the building, speaking a new language. The promenade section facing west is wide enough to be a gallery, but wide open to the park through a full-height, full-width screen of glazing. Stainless-steel mullions that reflect trees and sky vertically divide the glass, beyond which bead-blasted 5mm-thick fins form a continuous fringe of bris-soleil. 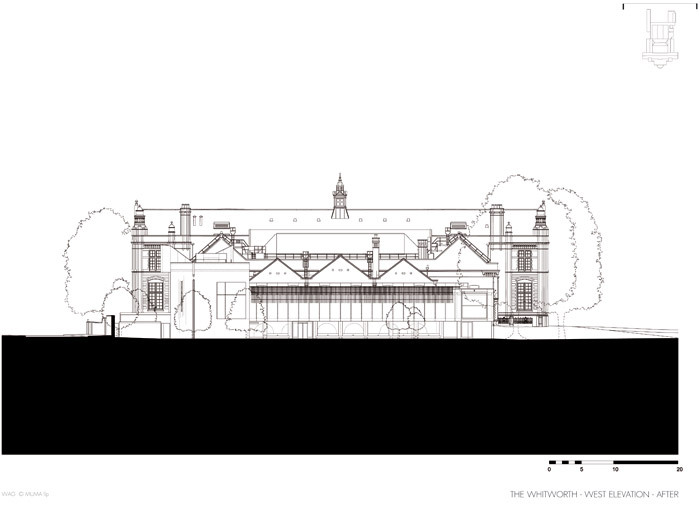 A whole storey below, a new courtyard space, destined to be an Art Garden, is enclosed by new extensions either side into the park. Turn left, past the turn of the promenade's passage that leads to the old South Gallery, and we enter the most dramatic of them - the cafe. This is an extraordinary long box whose stripped-back simplicity and transparency is worthy of Mies or Johnson. Stretching 40m in total, the cafe extends from its servery end into a completely glazed 28.5m length for seating, the last 4.5m of which floats out on a cantilever that hangs from cross-bracing in the roof. In the cafe, you are among the trees. The Purbeck floor and steel mullions continue, and the glass is fritted high up with vertical lines that become double density at the top. Look across the courtyard and the new north wing faces you. It is shorter in extension and more massive, a solid volume of red brick punctuated only by a single, long, horizontal window in the new lower-ground floor, which we will descend to shortly. 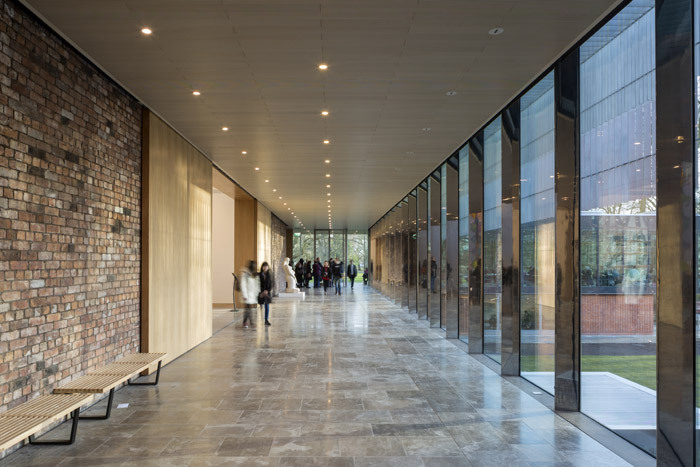 This north wing houses the new Landscape Gallery, a place for land art and sculpture, where the floor can take a 7.5 tonne point load, or 10 tonnes distributed load, and the ceiling height is 5.5m. A single west window next to a timber ventilation screen peeks out on to the park, but natural illumination is also diffused through a long northern skylight. 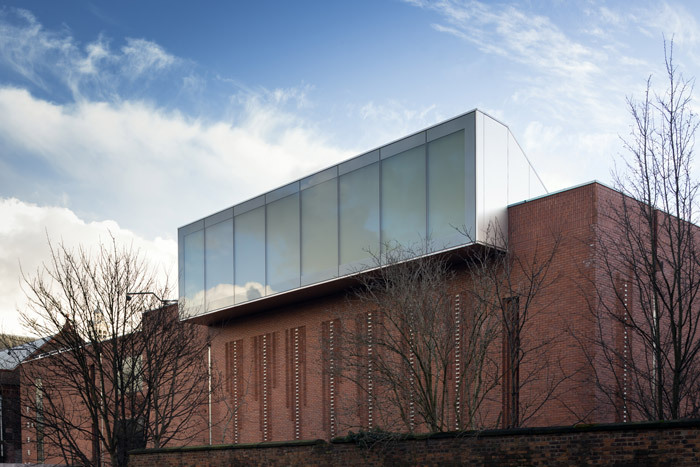 'The extension reacts to the urban edge with red brick and terracotta,' says McKnight, but out Denmark Road on the Whitworth's northern side this skylight pitches out of the brick-building's roof edge, an unexpected frosted-white volume that houses a great light scoop. It's so big it looks as if it should be a gallery in itself! Opposite the Landscape Gallery entrance, the promenade's passage to the old North Gallery accesses more new-build on the north. The small but tall Conservation Room, which has a tapestry hoist, has an even higher ceiling than the Landscape Gallery - 7.5m. Next to it, a window looks down on where deliveries come in from Denmark Road. There's a lift that's roomy enough for a classload of schoolchildren. And back by the Landscape Gallery, at the promenade's turn, stairs descend - past a slit window that will give a glimpse of a new street-side orchard - to the new lower ground floor. 'We've excavated the basement to create headroom,' explains McKnight. The blind western-end had half-buried, blocked-off arches disappearing into the grass, but now they are glazed and front the Collection Centre. Outside is another promenade, an echo of the one above and also paved with Purbeck (but here it's treated, off-cut stone). This is an environmental buffer zone with benches, glazing and bricked columns interfacing the courtyard. 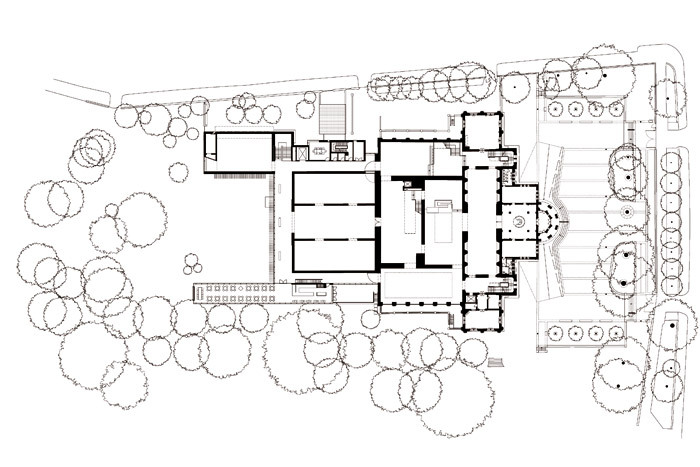 Not least it has an entrance from the courtyard - parkside access was a must-have in the brief. Below the Landscape Gallery is a Study Centre for scholarly work, cut into by that long window. Below the cafe is the Learning Centre. 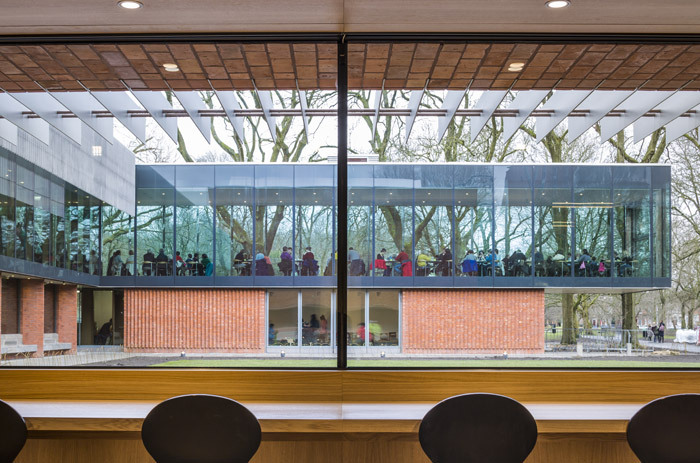 The students may notice that its long, solid south wall subtly curves, so that its bench is almost like a cinema row for watching the courtyard. Out there, Purbeck stone is used in benching, some of which disguises air intake. This extension is a tour-de-force of transparency and materiality that brilliantly exploits the site. Dissolving the barrier between park and gallery is clear, but internal sight-lines in the galleries and promenades also open up - as Balshaw comments, 'You're always catching glimpses of the next bit of art.' Metal, glass, stone and wood make a serene palette - warmer than gallerywhite, but not competing visually with either exhibits or parkland. The biggest player on the material field is the brick, which offered MUMA opportunities to play with patterns here and there, inspired by Whitworth textiles, says McKnight. Outside, the whole redness and texture of the bricks - developed for the Whitworth by Northcot - give continuity with the Beaumont building. Even the rough brick lining the promenade does something special - more muted than either the contemporary industrial chic of brick decor, or the tromp d'oeil that Ahrends, Burton and Koralek generated when an original Beaumont rear brick wall with windows was made internal for the Sculpture Court. McKnight, along with the other founding partners of the practice Gillian McInnes and Simon Usher, studied at Glasgow's Mackintosh School of Architecture, so it's not surprising that he cites the Burrell Collection in Glasgow by Barry Gasson and Brit Andresen that opened in 1983, as a reference point for Whitworth. You can see it in the flood of light in its internal arcade (tempered by stained-glass screens rather than fritting), enclosure of open green space (there, by an L-shape plan) and the materiality of the solid walls (sandstone rather than brick). There's more - in the Beaumont building, a staircase with a fine wrought-iron balustrade is open to public use. It leads to the restored Grand Hall, with a magnificent timber truss ceiling. It will be used for lectures, private events, workshops, and... yoga classes. And across the whole building, despite the increased space, the carbon footprint has been cut by a tenth, thanks to heat pumps, west-facing bris-soleil and thermal massing. Manchester may well want more when it sees how smart, sensitive design with a touch of the bold has transformed the Whitworth Gallery.